Video game developers spend a lot of time fine tuning and crafting the games they create. 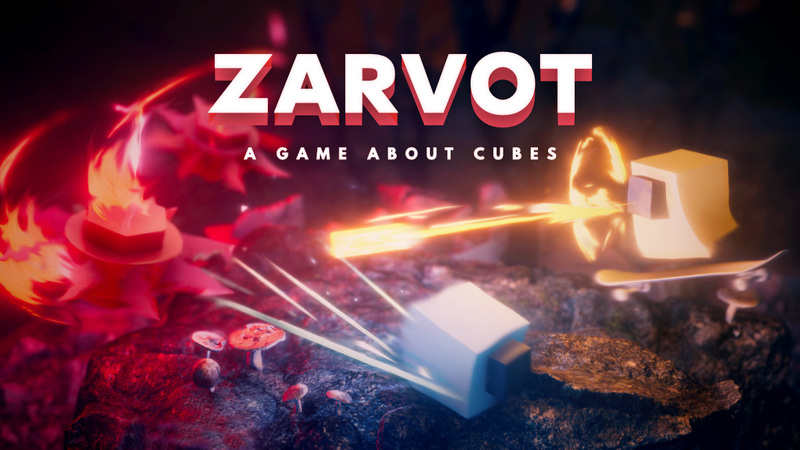 That’s why I was impressed when I heard that developer Snowhydra LLC spent four years on one project with their title Zarvot: a game about cubes. Originally developed as an arcade shooter, Zarvot has evolved, via the Unity Engine, into a full-fledged 3D experience adding multiple modes and a complete single-player story. The story of Zarvot follows two cubes: Charcoal and Mustard, who are trying to gather a number of items to give as the ultimate birthday present to their friend Red who has been depressed lately. I don’t want to ruin much of the narrative, but I’ll just say that it’s surprisingly well-told with quirky and humorous moments. Oftentimes the story will even break the fourth wallet its own expense. My only complaint with the story is that Zarvot sets itself up to be a discussion on depression with Red shutting himself off from the world and unable to express his feelings. I was expecting more depth and introspections with the narrative, much like in Celeste, but it never truly becomes memorable in any way. As long as you don’t expect more than a fun and silly experience you shouldn’t be disappointed. Zarvot is first and foremost an arcade shooter and each of the modes feature slight variations centering on the title’s combat structure. Whether in single-player or multi you’ll be jumping, dashing, and firing lasers to survive. The controls are easy to get used to with the left analog stick moving your cube around the isometric maps. Pressing the B buttons allows you to jump and double jump, and pressing the A button allows for a dash which provides temporary immunity during movement. Tapping the Y buttons fires bullets and holding it down will charge up a more powerful/penetrating beam. There is also a special ability by pressing the Y button, which allows for some type of melee ability. Fortunately, each of the A, B, X, and Y abilities have secondary mapping to one of triggers or bumpers, which I found more comfortable while maneuvering around a stage. Solo players can look forward to the story or arcade modes, while groups of up to four friends can battle against each other in five variations of versus matches. The story is brokeN up into 11 chapters and sees you moving through linear maps battling waves of enemies on your path to restoring Red’s happiness. My few gripes with Story mode include overly difficult areas without needing to be and I’m looking at the thin platforms in the Deep Freezer map in particular which was difficult to traverse and had me plummeting to my death multiple times. Also, enemies drop coins, or some type of currency, when defeated and I’ve yet to find any real purpose for them. The Arcade mode features 11 maps that must be unlocked by finding them in their corresponding story chapters. Selecting one of these levels pits you against five waves of enemies that you must try to survive with using the fewest amount of lives in the shortest time. Game mode is a fun challenge, but unfortunately, there are a few small issues. More than once, I encountered a glitch that made an enemy invisible and unable to be defeated, and the only way to reset this was to die and start all over again. Multiplayer options include Elimination, Deathmatch, Box Control, Sumo, and the Nintendo Switch exclusive Joy-Vault. Elimination is played in rounds where the last cube standing earns a point with three points needed in order tow in. Deathmatch tasks players with being the first to reach ten kills. Box Control is a unique variation where plates of sushi drop onto the map and the first player to consume 30 plats of sushi wins. Sumo is where each block tries to control and stay in the middle of a ring. Finally, Joy-Vault has a single-player use a joy-con to control a giant banana and sling enemies at the other players. With 15 maps, each boasting unique layouts and obstacles, there’s a lot to keep you occupied with Zarvot. I would have liked to see some power-ups incorporated to vary the gameplay and the ability to play online. While the gameplay isn’t perfect, it is simple and fun, and only gets better with some friends as you try to blast each other into bits. Visually, Zarvot has some impressive 3D components. While I liked the art direction of these nondescript cubes inhabiting a real-like world, it sometimes was hard to see all the action on-screen due to the chaos of particle effects and explosions. This is made worse when you take damage and the lower you’re health gets the more blurred the screen becomes. Fortunately, the level designs are fantastic and each area looks and feels distinctly its own. The audio is also on point as I enjoyed almost all of it. There could have been more songs to add more variety, but it was still great. The soundtrack is full of mellow jazz tunes during calm stages and more upbeat rock tracks for the more intense levels. From the lasers to the cube explosions, the sound effects fit perfectly. Each character may not have any voice acting, but they all have their own distinct sounds when they speak and it adds to the charm. Overall, Zarvot is a well-made shooter that is much deeper than what it appears. I am amazed at what small developers can achieve and Zarvot is no exception. While not perfect, it is a delight to play and more importantly is fun experience and worth checking out.